With the release of iOS 11.3, Apple Inc. has launched its Business Chat service in beta for users in the U.S., and the Cupertino, Calif.-based tech giant has chosen a Waterloo-based company to help power it. InTheChat is one of the six customer service platforms (CSPs) supporting Apple Business Chat, and is the lone Canadian company involved. 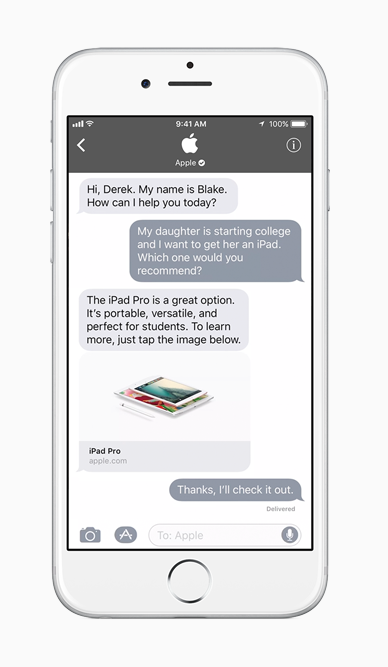 Through InTheChat, companies like TD Ameritrade and Newegg can use the new chat feature to communicate with customers directly through iMessage. InTheChat offers solutions such as self-service automation, routing, and bot integration, and for Business Chat, it routes customer inquiries through iMessage to an automated assistant or live agent. Apple’s Business Chat was one of the new features announced by Apple for iOS 11 last year, and with 11.3, users in the U.S. can finally test it out on beta. If you’re familiar with how businesses are using Facebook Messenger to communicate with customers, this feature works similarly: Apple users can connect with businesses via iMessage to speak to either bots or live agents, schedule appointments, or even make purchases through Apple Pay. And for those worried about privacy concerns, Business Chat does not share a user’s contact information with any businesses. Considering the troubles that Facebook has been dealing with in that department, Apple has the perfect opportunity to engage with businesses and consumers with Business Chat. Recently, Apple unveiled a new iPad and complementing software for education, and partnered with IBM to create smarter mobile apps.